Feeding and Swallowing Program - THERAPY 2000, Inc. THERAPY 2000 promotes skilled holistic feeding and swallowing intervention while promoting the advancement of best practice through direct treatment, patient advocacy, continued education, and community partnerships. THERAPY 2000 feeding and swallowing clinicians strive to address the below-listed hierarchy of needs to protect our children’s interest and enjoyment of food. One piece of a comprehensive feeding and swallowing intervention program may be VitalStim®, is an FDA-approved, non-invasive treatment method for feeding and swallowing therapy. VitalStim® uses neuromuscular electric stimulation to establish muscle-nerve memory patterns to help strengthen the muscles used for chewing, food management, lip closure, tongue movement, and swallowing. While training the muscles for strength, endurance, and coordination, it can help start an improvement cycle. 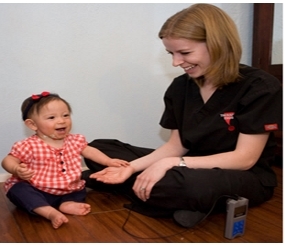 VitalStim® can only be provided by certified Occupational or Speech Therapists. With several VitalStim® Certified Therapists in each Division across Texas, THERAPY 2000 is committed to the best possible care for your child. If you are interested in learning more about our feeding and swallowing program, including VitalStim®, please feel free to contact us.